The parallels between visual art and music always have hidden in plain sight, yet that topic rarely is mentioned in art history books. Like music, visual art can resonate harmonically, or not, and even some carefully curated exhibitions can come across as tone deaf. Others maximize visual polyphony in ways that enhance how we experience even very diverse works, as we see in this 10th anniversary exhibition at Octavia Art Gallery featuring work by 10 artists. 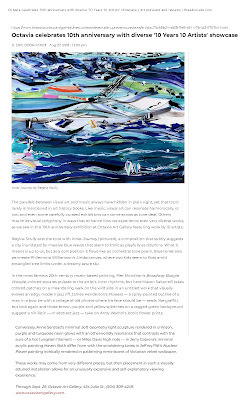 Regina Scully sets the tone with Inner Journey (pictured), a composition that subtly suggests a city inundated by massive blue waves that seem to frolic as playfully as dolphins. What it means is up to us, but as a composition it flows like an orchestral tone poem. Blue tones also permeate Philemona Williamson's Limbs canvas, where two kids seem to float amid entangled tree limbs under a dreamy azure sky. In the most famous 20th-century music-based painting, Piet Mondrian's Broadway Boogie Woogie, colored squares pulsate to the artist's inner rhythms, but here Mason Saltarrelli takes colored patches on a meandering walk on the wild side in an untitled work that visually evokes an edgy modern jazz riff. James Henderson's Flowers — a spray-painted outline of a man in a bow tie with a collage of old photos where his face should be — reads like graffiti, but look again and those brown, purple and yellow splotches on a ragged green background suggest a nihilistic — or abstract jazz — take on Andy Warhol's iconic flower prints. Conversely, Anne Senstad's minimal Soft Geometry light sculpture rendered in crimson, purple and turquoise neon glows with an otherworldly resonance that contrasts with the aura of a hot tungsten filament — or Miles Davis high note — in Jerry Cabrera's minimal acrylic painting Haven. Both differ from with the smoldering tones in Jeffrey Pitt's Nuclear Power painting ironically rendered in patterning reminiscent of Victorian velvet wallpaper. These works may come from very different places, but their placement in such a visually attuned installation allows for an unusually expansive and self-explanatory viewing experience. Published in Eazel Magazine, Korea. Last May, Anne Katrine Senstad, a Norwegian artist living in New York, unveiled her latest work, ‘Elements’ as part of ‘Through the Spectrum’—a group exhibition at Athr Gallery in Jeddah, Saudi Arabia presenting Senstad's work alongside that of James Turrell, Carlos Cruz-Diez, and Robert Irwin. 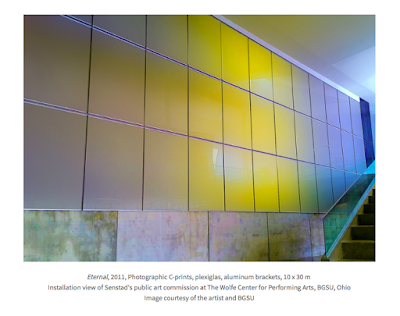 Senstad views 'Elements' as the culmination of her lifelong project of exploring light as a medium, narrative, and connection between space and environment. Throughout her career her sculptures and installations have invited the viewer to a meditative spatial experience. Eazel: Anne, congratulations on the inclusion of your light installation, Elements in the group exhibition, Through The Spectrum at Athr Gallery in Jeddah, Saudi Arabia this summer. Tell us about the exhibition and what it feels like to show work alongside such prolific artists as James Turrell, Robert Irwin, and Carlos Cruz Diez. Anne Katrine Senstad (Anne): Thank you! Well, it has been an honor and a dream come true as the artists you mention are inspirational figures in the art world that I have looked up to for many years. 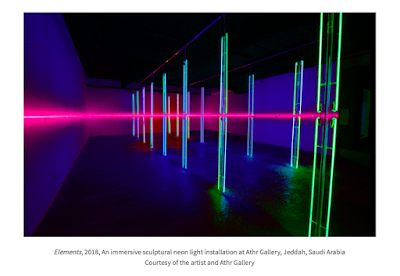 And Athr Gallery is the largest, and arguably the most important, gallery in the Kingdom of Saudi Arabia. With three floors, as well as outdoor space dedicated to presenting installation work, I would say it functions more like a museum than a gallery. Considering such, the curators of the exhibition designed an experience that serves as a visual-perceptual journey from one installation to the next—a labyrinth of light and color, so to speak. The participating artists’ respective visual, textual, and aural languages span generations and cultures in their exploration of the relationship between the West and the Middle East. Speaking to Elements, I view this work as a continuation of my exploration of the foundational elements of light, sound, and spatial relations with special attention paid to how the viewer perceives their various interrelations. At the same time the exhibition is something of a new chapter as it represents the most complete form of light sculpture I have executed to date, building upon previous works. With Elements I have effectively merged several of my modes of expression. In executing the installation I was interested in exploring the idea that light can be presented simultaneously as form in the abstract, as well as form in spacetime—a dense spectrum of frequencies and temperatures that invoke the subjectivity of color and the sensorial realm of the viewer’s experience. Eazel: You have described yourself as a baroque minimalist. Which artists have influenced you in this regard? Anne: Baroque minimalism is something of a playful contradiction of terms—as minimalism represents a reductive sensibility, commonly speaking in a monochromatic language to define space and object, while Baroque connotes maximalist expression of form and color. My installation and photographic works have always sought to test the reasonable harmony between light and color, pushing the terms of this harmony with saturated colors that respect their spatial context. In this sense, my work is about exploring the sensorial and cognitive realms of perception, decoupling form and concept and transcending designations such as line, shape, void, and color. I have been exploring the perceptual interrelations between light and color, and object and space across various disciplines for over 25 years. My artistic practice has also been informed by land art—like Michael Heizer’s semi-architectural land interventions, Robert Smithson’s diverse land works and mirror installations, and Dan Flavin’s fluorescent tubes in various sculptural forms—which to me are all about the spatial context of the light object. The kinetic movement in Latin America of the 1950’s is another major influence. And of course there’s James Turrell and Robert Irwin. I love Irwin’s garden installations, and his hyper-minimalist perceptual works in particular. Sound and literature also contribute to my visual language. I’ve been working with composer, mathematician, and philosopher, Catherine Christer Hennix for the past 6 years. Her work in sound composition and technology pushes the boundaries of experimental drone sound emulations. JG Thirlwell is another collaborator whose cinematic and boisterous aural language complements the baroque aspect my work rather well. Eazel: It would seem your aesthetic sensibility connects elements of architecture with aspects of nature on a fundamental level. How does nature inform your practice as an artist? Anne: As an artist I am inspired by context and space—as well as our relation to nature, both as a force and as material. I like to explore large, open spaces charged with historical narratives for my site-specific installations. I find that the aesthetics of nature have a way of articulating certain harmonies that inform my artistic sensibilities. 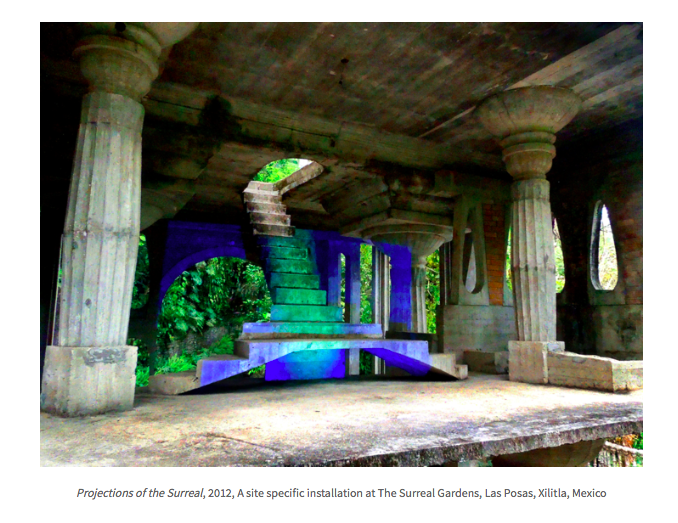 For example, in 2012 I was invited by Mexico City-based British architect, Matthew Holmes to create a site-responsive installation entitled Projections of the Surreal—a series of time based abstract color projections onto the crumbling concrete architectural surrealist structures at The Edward James Foundation's The Surreal Gardensin Las Posas, Mexico. Artcollector Edward James built the gardens in the 1950s as an escape from what he saw as the oppression and constraints of formal society—a sort of feverish vision of the Versailles gardens in the jungle. Under the auspices of the foundation, the mission of the project spoke to the evolving relationship between nature and the structures that humankind realizes within its domain. In this case, the aim of the installation was to raise awareness for the need to preserve James’s culturally significant landscape also leading to a short film with the same title which examined the history of Mexico's intertwined pre and post colonial history—my multiple color interventions serving as the main symbolic protagonist and narrative vehicle in this regard. I further explored this practice in Saudi Arabia as part of my collaboration with the German architect, Dr. Anna Klingman who developed an art and architecture program for the preservation of traditional stone and mud buildings in historic villages in the Asir region of southern Saudi Arabia. 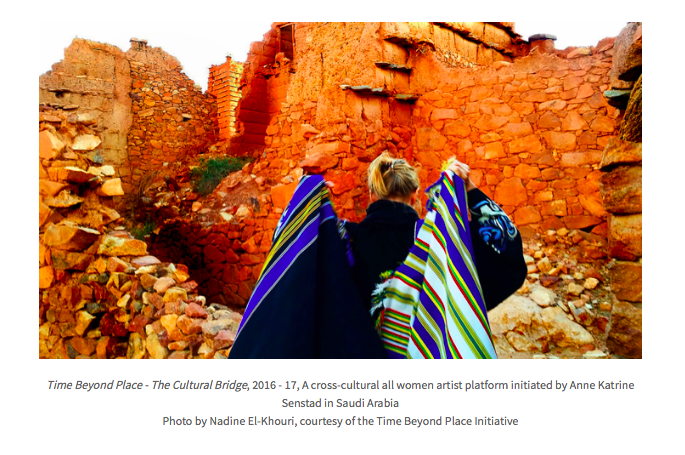 This project would eventually lead me to another project in Saudi Arabia, Time Beyond Place over the course of 2016 and 2017 in which I initiated a women-run artist platform to champion contemporary art practices, social engagement, and to the preservation of the cultural heritage of rural Southern Saudi Arabia—with particular attention paid to the historic architecture of the region, as well as its pre-Islamic women's artisanal practice of Qut wall painting. Eazel: I’ve read that your work has been influenced by the architectural philosophy of Snøhetta. Anne: I appreciate Snøhetta's philosophy and vision. 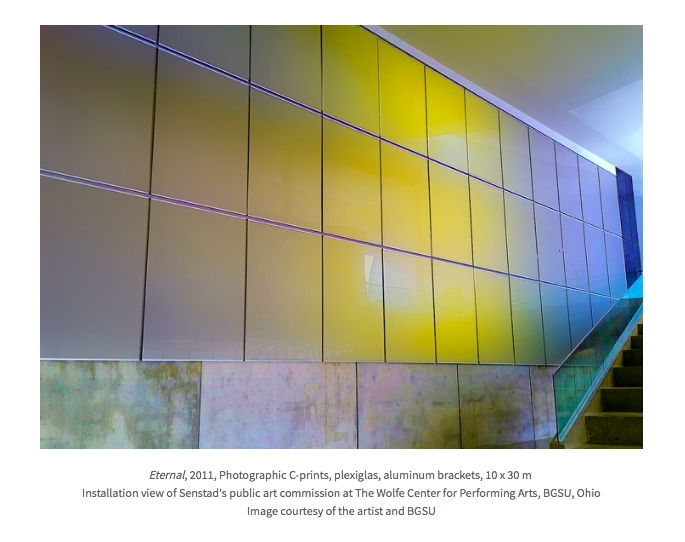 I worked with them on my largest public art commission for the Wolfe Center for the Arts at BGSU in Ohio from 2009 to 2010. Their practice—I have found—is oriented around discovering new aesthetics without imposing postmodern ideas on nature. They are probably some of the most humane and innovative architectural firms around—alongside BIG from Denmark. Eazel: The synesthetic nature of light installations would seem to invoke the subjectivity of color—that is, the degree to which the elements of light and space combine in the viewer’s perception. What are your thoughts on how the notion of the viewer’s perception relates to the outside world? Anne: In Bachelard’s The Poetics of Space, there is a quote by Rainer Maria Rilke, “The world is large, but in us it is as deep as the sea.” I believe the overarching project of the artist is to explore the parameters of the human being’s sensorial experience of the world around her—to lead her to becoming more self-aware and cognizant of her own perception of this outside world, abstracting its elements on their own terms. Artists of all disciplines live in the space between interpretation and creative expression. We’re sensitive people with a deep curiosity about this transcendent interstices. Ultimately the perception of art hinges on how its experience inspires the viewer to see new things and connect with her environment in new ways. In this regard, I believe art has the potential to drive change in social and ecological contexts. Speaking to how I have practically executed on this idea, my work mixes analogue techniques and materials such as celluloid film that directly records light and color, and neon light tubes as opposed to artificial LED lights—to name a couple of specific examples. For me the materiality of the tools I use in my work is an important part of my process. For example, neon has this organic quality that I find to be stronger and more pleasant than LED light—both in terms of the physical, as well as the psychological spaces it creates. In working with neon, I’ll manage color variations by adapting various combinations of gases and different types of glass tubes. I find that with neon the color temperatures are purer and the light frequencies may be experienced synesthetically in navigating the physical space they create—the electric currents in the gasses create a soft atmospheric glow the viewer feels all over her body. In other works such as Universals, my sculptures derive from the project of solidifying light, whereby I realized light and color interventions by projecting my abstract color video work, Color Synesthesia I-VII, onto architectural structures, recasting physical and psychological aspects of these spaces. With Universals I was inspired by Plato’s various concepts of perception, as well as Malevich’s essays on Suprematism—drawing from these works’ views of art as perception—that is, art being a representation of an object or idea—rather than the actual idea itself. Eazel: In contrast to your work with light, your text art would seem to convey a playful sensibility—like Forget Flavin in Shanghai and Gold Guides Me at the Bruges Art and Architecture Triennial. What are your thoughts on the contrast between the direct communication of the latter and the subtle modality of the former? Anne: In approaching light as a medium I’m thinking more on a technical level with the objective of creating an atmosphere or feeling in the viewer. This is more of an iterative process that entails problem-solving related to execution of a given installation. With text works I’m still thinking in these terms as I’m utilizing light through neon signs or the aesthetics of large advertising signage; however, in realizing an experience my process is focused more on how to best engage with the reality of the sociopolitical issues my work is addressing. This is where I get to employ my wit and humor in adapting phraseology from history and literature to create new meanings. Eazel: Anne, thank you so much for sitting down with us. 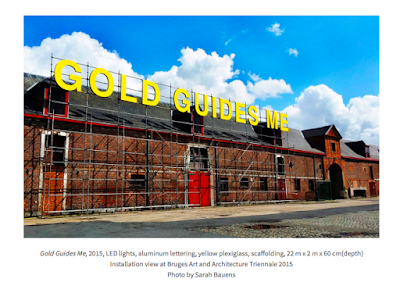 To conclude, I was wondering if there is place in the world you dream about as the location for a site-specific installation that is still gestating in your imagination? Anne: There are quite a few places I dream about; however, there is one in particular that continues to pique my imagination—The Park Avenue Armory here in New York City. I envision something comparable to Turrell’s transformation of the Roden Crater—a structure that connotes humankind’s civilization of the Earth while manifesting aspects of the cosmos beyond and connecting these spaces to the universality and depth of the human psyche. It would entail my light and color vocabulary—perhaps including sound, textiles, and semi-transparent mirrors. I have also thought about an installation making a statement about humankind and its relationship to technology near the Large Hadron Collider in Switzerland. I have studied its circular architecture and have ideas for connecting its shape to themes related to the Russian Cosmism movement’s search for utopia. There are many possibilities for this location and I have thought a lot about connecting its current cultural significance to ideas of transhumanism, notions of the eternal through art, the relationship between art and science, and the dynamics between society and technology. 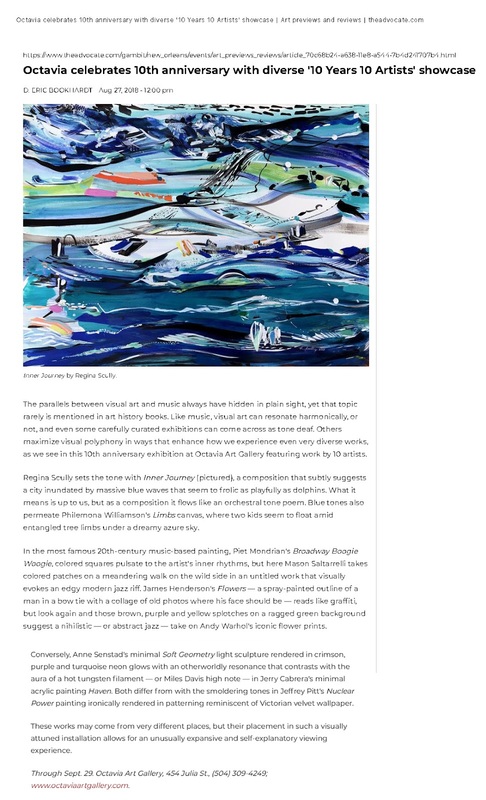 This article has been published simultaneously across Raincoat Society (raincoatsociety.com), Art Frontier (艺术汇, China), and Eazel. Tansy Xiao is an independent curator, artist, poetry translator, and founder of Raincoat Society—a non-profit group that helps artists across cultural backgrounds better express their ideas. Having lived and traveled throughout 50+ countries, Xiao received her art education in hundreds of museums and thousands of streets worldwide before settling in New York. All images courtesy of the artist unless otherwise indicated.